As mentioned last week in this here (brilliant and inimitable) feature, ain't much to talk about today. This week is a "comic book skip week," and there will only be a small handful of titles available at your shop. These books were shipped to retailers last week, and they were instructed to hold off on selling them until today. Of course, there's a catch. Some stores won't have anything out today, because there was a choice for them to make. Not all retailers wanted the books, and so they didn't sign up and swear (with a blood oath, one can only assume) not to sell them early. So, if you plan on heading down to ye olde comics shoppe today, I'd suggest calling ahead and making sure your retailer will actually have the titles. I know mine won't and that's fine, since I wouldn't have made the trip for three books, anyway. But, as a super-special side note, we here at Exfanding HQ will be making a comics shop run later this afternoon, as part of our yearly holiday season tradition. (In which we spend money we shouldn't spend/don't have on things we don't need/don't have any room for.) Still, it's a wonderful tradition, and one that I am greatly looking forward to partaking in. We're a little late this time around, but hey, it still counts. We'll be hitting up some (far, far away) stores that we don't get the chance to visit too often, and that'll be lots of fun. But before that, we'll be watching the final installment in our Introduction to the Films of Akira Kurosawa as we settle in (or, more appropriately, hunker down) to watch Seven Samurai. A review will follow shortly. And it will be hilarious and insightful, usually at the same time. And there's plenty of other good stuff coming, including our Year in Review, in which we extol the greatness that is us. So be sure to check back often. Now, if you haven't figured it out just yet, I am most definitely stalling and trying to fill this post with as many words as possible before getting to the actual comics that ship today. Why? Well, because there's only one that I want to talk about, and I need to pump up my word count. You know, for my ego. I could talk about the utter weirdness of a week without comics, but I don't really have a strong opinion on the matter. I tend to think that a comics shop without new comics is kinda like a mobster with no one to whack, so the whole point of the "skip week" is a little baffling to me. I guess the argument is that this week is typically slow, what with the holiday and all. But, especially this year (when many employers are instituting a mandatory furlough for this week to save some dough), I'd think that there are plenty of people with days off, just looking for something to do. I'd have to imagine that a lot of folks couldn't take vacations, and if they did, they are most liekly at the house of a family member. And if that's the case, comics fans would most certainly be looking for a local shop to haunt. One can never underestimate the importance of getting away from family for a while. But, Diamond, Marvel, and DC don't see it my way. So you and I don't get new books this week. Oh, well. Now that that's out of the way, I guess I might as well provide some info on the book that will be shipping today, and that I have some interest in. 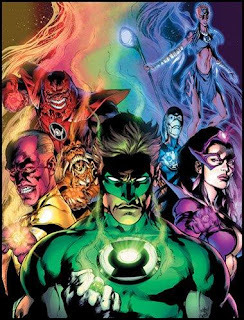 Today, DC releases issue six of the Geoff Johns epic, Blackest Night. Not much to say other than, if you're reading this issue-to-issue, then I'm sure you'll be buying it today. If you're waiting for the trade...um...you won't. Be buying it today, that is. It's a great series--easy to follow, fun to read, and with some great surprises along the way. Everything you want out of comics, really. Here's the too-witty-for-its-own-good blurb on the book. The secrets of Nekron are revealed as darkness consumes the DC Universe. Everything else: TOP SECRET. On sale December 30, 2009 only at comic shops participating in DC's "Green Christmas" program. Non-participating comic shops will offer the issue for sale beginning January 6, 2010. Check with your local comic shop for applicable on sale date. So, y'know, if your shop won't get the book, I'd steer clear of the Internet for a while. You know what I envision happening? If a fan's favorite shop doesn't get this in, he or she is going to go to another shop in the area to buy it. Then, when the favorite shop finally gets the book next year (okay, that's taking it a bit far, but you can't tell me it's not true! ), that shop will be stuck with a ton of these things. You'd have to imagine that orders are high on this series, so even a non-participating store is going to have a bunch of these. A week late. Sometimes I don't get the comics industry. Anyway, that's a rant for another day. I'd ask what you all are Waiting for, but I think I already know the answer to that. Still, since it's the last issue of this feature for the year, I just want to say thanks for reading, and stay tuned for WfW, Volume Two, coming next week!